Nagorno-Karabakh: a time-bomb in the Caucasus? Last April, fighting between troops from the self-proclaimed republic of Nagorno-Karabakh and the Azerbaijan army rekindled a conflict that had been frozen for more than 20 years. We've always expected the war to start again. There's always been gunfire. Now all we want is a peaceful solution." On the Armenian side of the front line, many of the soldiers Euronews met were barely 20 years old. But some had already experienced war. “We’re defending our homeland, our family, and all those who live on this land,” said one, Aram Yegoryan. Part of Azerbaijan in Soviet times, this region in the South Caucasus, populated mostly by Armenians, proclaimed its independence in 1991. A war ensued, leaving more than 25,000 dead and a million displaced. A ceasefire was reached in 1994 after the Armenian military victory. But ever since, clashes have repeatedly broken out. The area we visited, north of the so-called contact line, was where heavy fighting broke out in April. The calm restored since is fragile. “We are not allowed to go beyond these trenches. On the other side, Azeri forces are just a hundred metres away. So, despite the ceasefire, these soldiers stand guard day and night,” Euronews correspondent Valérie Gauriat reported from the scene. Supported in April by many volunteers from Armenia, Nagorno-Karabakh’s army says it stands ready at any time to face an offensive by Azeri forces. “Since the ceasefire in 1994, the opposition has always violated the truce. They were the ones who started it last April. There’s no reason why they wouldn’t do it again. We’re better prepared now, and if it happens, we will resist it very strongly,” said Sevak Sardaryan, Chief of Artillery on the northern front. Close to the frontline is the Armenian village of Talish, a symbol of the 1990’s war. Last spring it was entirely destroyed again. All the inhabitants were evacuated. Three civilians who refused to leave the village were killed during the offensive, we are told. One of the displaced residents, Garik Ohanyan, returned to the scene to show us what was left of his house. Debris lay on the floor and the building had been badly damaged. Garik found refuge in a neighbouring village, at his in-laws, where he now lives with his mother, his wife, and their five children. Living conditions are difficult, but they are afraid to go back to their village. “My other son died in the first war, I get a pension for that. I only have one son left, who has five children. What are we going to do now? We have no home, no job, and we’re stuck here,” said Garik’s mother Amalya Ohanyan, sobbing as she spoke. “Since we first fled the village, back in 1992, and up until today, we expected the war to start again. There’s always been gunfire. Now all we want is a peaceful solution,” her son added. We want to go to the other side of the frontline, in Azerbaijan. But it’s impossible to get there directly. Transport routes between Nagorno-Karabakh and Azerbaijan are cut off. As the crow flies, only about 15 kilometres separate the village of Talish from the Terter region, where we are due to meet the Azeri military. But we have to drive to Yerevan, the Armenian capital, then fly to Georgia: it is the only way to reach Baku, the capital of Azerbaijan. From there, another long drive awaits us to reach the front line, this time on the Azeri side. Here also, the soldiers are on alert. Armenian troops are less than a hundred meters away. “You have 30 seconds to have a look, to film and get out,” our translator said, passing on the instructions from the Azeri military. From one of the hills retaken from the Armenians last spring, we can clearly see the village of Talish. The Azeri army also accuses the other camp of having triggered hostilities during the latest conflict. “The clashes in April happened because of that! There were provocations by the enemy. And as a result our army retaliated, and pushed back the enemy. Our army is professional, competent and powerful. As our commander in chief always says, we will never give up a single plot of our territory to the enemy,” Colonel Valeh Rabajov tells us. We head to the nearest Azeri village, Tapqaraqoyunlu. There were no civilian casualties here in April, but the damage was significant. The inhabitants were able to return home quickly; the state is funding reconstruction. Valerie Gauriat was shown one of the houses now being rebuilt. 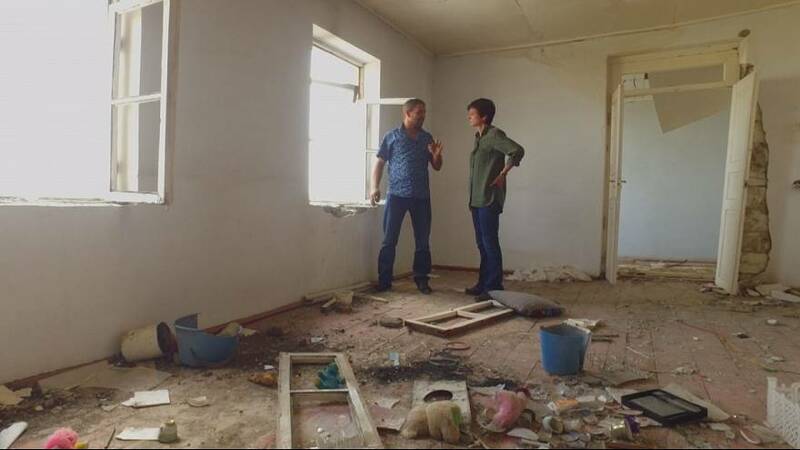 “We are in one of the houses that was completely destroyed in April. More than 200 were damaged, but three months later, almost everything has been repaired. This house had been destroyed by two grad rockets,” our correspondent said. In Soviet times, there was much interconnection between the Azeri people of this village and their Armenian neighbours in Talish. The foundations of the house we visited were built by Armenians. But today, resentment between the communities runs deep. “Our water source is on the other side of the Armenian positions. We go there at night so they don’t see us. Many people have been killed while fetching water,” said one Tapqaraqoyunlu resident, Nasraddin Mustafayev. As in Talish, everyone here fears a resumption of fighting. After the conflict in April negotiations were revived under the auspices of the Minsk group, led by Russia, the United States and France, within the OSCE – the Organisation for Security and Cooperation in Europe (OSCE). It brought no convincing results. The international community recognises neither the independence of the self-proclaimed republic, nor its institutions in the city of Stepanakert. “We believe that we have to return Nagorno-Karabakh to the negotiation table. Twice, in 1991 and in 2006, the people of Nagorno-Karabakh voted for the independence of this Republic. The decision of the people of Nagorno-Karabakh, the result of their vote, have to be taken into account and become a cornerstone of any further settlement,” Karen Mirzoyan, the self proclaimed republic’s foreign affairs minister told us. Lacking international recognition, the small enclave struggles to develop its economy and attract investors. It relies on the financial support of Yerevan and Armenian communities around the world. Agriculture remains the principal resource of this fertile region. We head to the main food processing company in Nagorno Karabakh, Artsah Fruit. Eighty-five percent of its products are bound for export. To get round the political obstacles, local businesses reach foreign markets via joint ventures with Armenian companies. “As Karabakh is not recognized, we can’t export our products directly onto the international market. That forces us to find partners thanks to whom we can export,” said the company’s director, Armen Tsaturyan. But when we ask about the countries of destination, he becomes evasive. “No, I prefer not to tell you,” he says. “Why not? Because of the politics?” we ask. “Yes. And because of my business partners,” he replies. Importing countries do not officially recognise Nagorno-Karabakh. The address printed on the company’s packaging is in Armenia. But the firm’s name clearly states the product’s origin: Artsakh, for Armenians, indicates Nagorno-Karabakh. The recognition of Nagorno-Karabakh as a state is also what Karen Matevosyan and his family have longed for. Karen settled here in Stepanakert after he, his wife and their young son fled the pogrom targeting Azerbaijan’s Armenians in 1988, in the town of Sumgaït. “It was really horrible. They burned people alive, they raped women, even children. I would not wish what we went through during those three days in Sumgait on anyone, even my worst enemy,” he said. Karen and his wife can no longer imagine leaving Nagorno-Karabakh, the land of their ancestors, and now theirs. The war in April revived painful memories when they saw their son leave for the front line. “The only good decision to take is for Azerbaijan to recognise our independence. They ought to say ‘live life as you like to live it,’ and we’d do the same. We could then become closer, but as two independent states. Without such recognition, the current situation could last a lot longer, a hundred, two hundred years, and we’ll continue to live under pressure, not understanding each other,” he added. But recognising Nagorno-Karabakh’s independence is inconceivable in Baku. The most Ilham Alyev’s government would agree to would be to grant the enclave significant autonomy, and demand that the Azeri refugees of Nagorno-Karabakh return home. The solution must in any case be peaceful, says one of their representatives in Azerbaijan’s parliament. “It’s in Azerbaijan’s interest to recover its illegally occupied territories through peace negotiations. But 20 percent of Azerbaijan’s land is under occupation. Of course independent Azerbaijan will never accept this occupation. This land must be returned,” Rovshan Rzayev told us. We head to Quzanli, in the Agdam region: one of the territories bordering Nagorno-Karabakh that came under Armenian control after the 1990’s conflict, to reduce the risk of an Azeri offensive. Less than a quarter of the Agdam region has remained under Azerbaijan’s control. Some 50,000 Azeris displaced from Nagorno-Karabakh live here: they make up more than half the local population. It’s a considerable burden on the region’s shattered economy. Unemployment is endemic, especially among refugees, who depend on state aid. “There are no factories here. There’s no local industry, because it’s a high-risk area. No company wants to come and invest here!” says the Deputy Head of the Agdam region, Aga Zeylanov. Displaced from their village in 1993, Eldar Ahmedov and his wife Mazali raised their children in this house. Their lives here are in limbo; their dream is to return to their homeland. They are inconsolable since one of their sons, a soldier, was killed in combat two years ago. “If our land is freed then the death of our soldiers will have served some purpose. Our soil is drenched in the blood of martyrs. If our land is freed, their souls will be relieved. They will not have died in vain,” Eldar said. “I only want the children to stay alive and safe,” his wife Mazali added. Back in Stepanakert, the TUMO centre aims to give Nagorno-Karabakh’s teenagers a window on the world. After school, free workshops equipped with high tech tools help introduce them to creative technology. Samvel Sargsyan, a student at the centre, lost his uncle in the conflict. A loss that inspired his first project: a photo exhibition dedicated to the everyday life of Armenian soldiers on the front line. “I wanted the public to see our strength by looking at these photos, our spirit. And to see that these men are always ready. I wanted to show the positive aspects, not the negative ones. I’ve seen the bad side of things, but I chose to show the good sides,” he said. On both sides of the front line, the spectre of war is rooted deep in the minds of the children of the Nagorno-Karbakh conflict. In the Agdam region of Azerbaijan, a football match was dedicated to a commander who died in combat. Azeri soldiers play against civilians from displaced families. For Quzanli resident Shunasib Edilli and his friends, it’s a natural coexistence. Nagorno-Karabakh: peace or more peril?